For most of those fabulous '60s, to be a bona-fide, hard-core, full paid-up Bob Dylan fan didn't demand much more than buying the records, enthusing about the songs and Dylan's singing to incredulous friends and puzzled parents, dreaming about one day seeing him in concert, and always waiting, with tetchy impatience, for news of what he was up to. In the faxless '60s, when TVs were still steam-driven and urgent correspondence was carried in the saddlebags of the Pony Express, news of Dylan's doings would often come limping along months after the event. Over in England in 1965, Dylan was being hailed as a great new folk singer, and his "latest protest" -- "The Times They Are A-Changin'" -- was storming into the Top 20, several months after the decidedly non-folk rock-rap recording of "Subterranean Homesick Blues." Even in the States, not everyone was hip to what was happening. In Newport, the fussy old folkies who'd cherished the socially outspoken Bobby Dylan stuck their fingers in their ears and yelled "turn it down!" as Bob and the Butterfield Band raved on at the infamous 1965 Folk Festival, even though "Like A Rolling Stone" had been roaring out of every radio set just about on the hour in the week leading up to that "first electric concert." Times sure were different then. By the end of the decade, die-hard enthusiasts had recording of Bob Dylan singing 103 songs on nine Columbia albums, not counting the "Greatest Hits." Each of the records had been bought with baited breath, and carried home in triumph, with the rest of the day set aside for lyric transcription, analysis, and the appropriate indulgence of wonderment at how different each record was from the one that had preceded it. But then in late summer 1969, things changed. And for Dylan fans, life was never to be the same again. It all began when a strange white label 'bootleg" record called "Great White Wonder" came out of California. It was, as far as the fans were concerned, the tenth new Bob Dylan LP, though it didn't say so on the sleeve. Although it sounded as though it had been recorded by means of tin-can-and-string technology, it was crammed with delights. Half of the tracks were taken from "The Basement Tapes," gloriously crazy songs recorded with The Band in Woodstock in 1967; the other songs on "Great White Wonder" were recordings from 1961, on which a very young bob Dylan sang his way spiritedly through all kinds of great blues and folk songs -- why, he even tried telling a joke! For the most part this stuff was great -- and seemed all the more exciting just because, being rare, unreleased, and most certainly unofficial, it was something that we shouldn't really be listening to -- forbidden fruit, and the sweeter for it. The record company was understandably outraged, the copyright people were justifiably up in arms, but we had Bob Dylan singing "Baby, Please Don't Go," and "This Wheel's On Fire," and "I Shall be Released," and life had never seemed so good. Then, in December 1969, In "Rolling Stone" #47, the second anniversary issue, Greil Marcus was let loose over five big pages to enthuse about countless hours of other unreleased Dylan tapes that he'd scrambled and hustled for himself; private recordings in friends' apartments, tapes of early coffeehouse gigs in Greenwich Village, and songs recorded for, but never used on the official albums; outtake versions -- some of them with very different words or arrangements -- of songs we already knew; and tapes of concerts, both solo and with The Hawks, later known as The Band. "Dylan's greatest recordings," Marcus maintained. Thus began the great tape hunt, the quest to collect anything and everything that Bob Dylan had ever recorded. Over the last 20 years, a feverish underground network of collectors has been at work, tracking, tracing, and trading tapes. And now at last, something of the true extent and value of much of the buried treasure long sought after by tape collectors is brought to light. In this cornucopia of previously unissued material are stashed home recordings, demo recordings, outtakes, alternative takes, coffeehouse recordings, concert recordings, and more. Much of it teaches us a good deal about the way in which Dylan developed as a songwriter or performer in those early years; some of it is nothing short of sensational -- performances of staggering power and subtlety and seemingly infinite variety. The main focus in this collection is on Dylan as the songwriter: 38 songs that have never been released on an official album, as well as demo and rehearsal versions of well-known songs. Subsequent volumes will deal with live work, including the legendary 1966 Royal Albert hall appearance. For those who never suspected this material even existed, there are untold delights in store. And for those exhaustive and insatiable collectors, the "completists" who like to think that they've heard everything, included here are a bunch of previously unsuspected tracks. 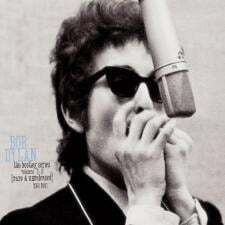 Whatever reputation Bob Dylan has enjoyed as a writer and performer in his 30-year recording career will inevitably have to be reviewed in the light of this historic collection. And if the writers and critics who are called upon to reassess Bob Dylan's achievements find that the superlatives have all been used up on his back catalog of official releases, they'll just have to come up with a bunch of superlative outtakes, won't they?